The pastime of hiding and searching for decorated rocks is really taking off and is an excellent way to get children away from the TV/computer and doing some exercise ... and fun for adults too! We were pleased to donate a bulk bag of cobbles to the organisers of the local "Hidden Rocks" group. Everyone can join in the fun. The idea is to get a rock, stone or pebble, decorate it with pens/paints/glitter, write "Hidden Rocks Facebook" on the back, then seal with varnish to protect. When dry, hide your creations for others to find and wait for them to be found. You don't have to be an artist - every scribble, line or splodge is a masterpiece and is loved by all that find it. More details can be found in the Hidden Rocks Facebook group. If you find a rock please take a picture and post it to the Hidden Rocks Facebook page, then either leave it for others, take and hide it somewhere else, or replace it with one of your own hidden rocks. During the Easter holidays, Hidden Rocks organised an Easter Egg Hunt at the Bordon Inclosure, with the help of Deadwater Valley Trust. This was followed by decorating hidden rocks. This event was free of charge thanks to some amazing people. The rocks were donated by us and the pens and varnish were donated by admin of Hidden Rocks. The idea was to go on an egg hunt then collect a special Coomers stone and decorate it. These were then varnished to either be hidden or to be taken home. There were also some bee friendly seeds for the children to take away and grow. 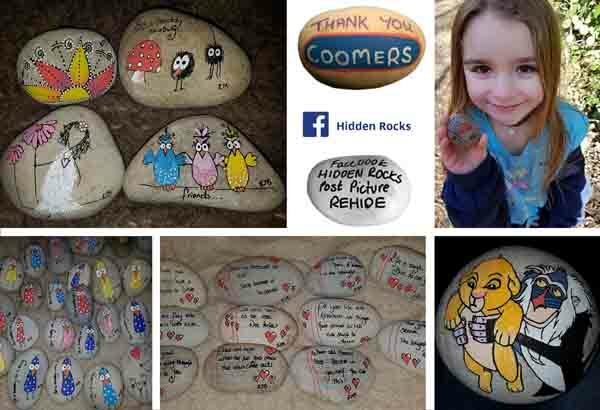 Why not join the Hidden Rocks Facebook group and get involved in this fun activity?